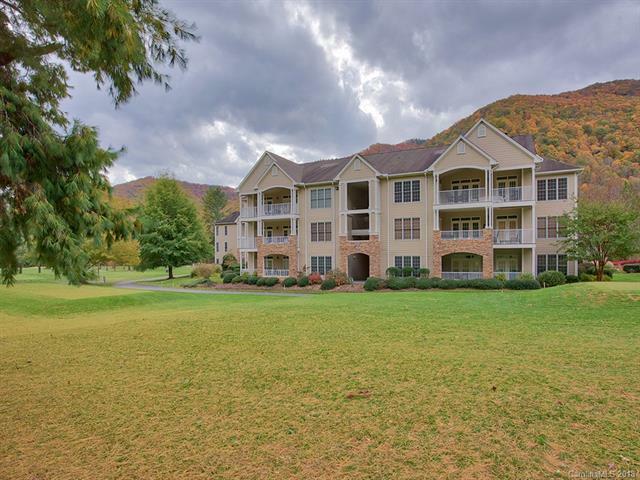 Imagine the convenience to golf course, restaurants, towns from this 3/2 condo in the Maggie Valley Country Club, overlooking the 8th fairway & green, and on out over the mountains. High ceilings, gas fireplace, breakfast bar & open floor plan. Elevator or stairs to 2nd floor. 2 Guest bedrooms with en suite bath. Spacious master bedroom suite. Windows, French doors (from living room, master, & guest) out to porch to enjoy the sunrises, sunsets & seasons! Great rental or year-round living. Washer/Dryer in unit. Clubhouse, pool, fitness, tennis, hot tub all nearby & available - golf/restaurant open to public. Furniture included. No garage, but lots of available parking spaces.